"Confirm Brett Kavanaugh for SCOTUS!" The nomination of Judge Brett Kavanaugh represents yet another promise made and promise kept by President Trump. 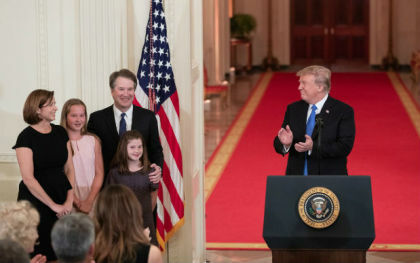 A true constitutionalist, Judge Kavanaugh is exactly what the American people want and what President Trump promised to deliver! Brett Kavanaugh is 53 years old and has served as a federal judge on the U.S. Court of Appeals for the District of Columbia since 2006. Judge Kavanaugh is well respected by sitting members of the Supreme Court. Furthermore, Judge Kavanaugh is a man of tremendous humility and moral integrity. He is a dedicated family man with a lifetime of service to his church and community. Judge Brett Kavanaugh deserves robust bipartisan support, notably from Senators Manchin (WV), Donnelly (IN), Heitkamp (ND), McCaskill (MO), Nelson (FL), Brown (OH), Baldwin (WI), Tester (MT), Stabenow (MI), and Casey (PA), whose states voted for President Trump in 2016. These senators ought to place liberal special interests aside and listen to their constituents instead! Judge Kavanaugh should be swiftly confirmed by the U.S. Senate!